A picture of the marijuana that waa allegedly found in possession of a Pouderoyen, West Bank Demerara resident at the Bartica Ferry Stelling. An unemployed woman and a man have been arrested in Region 7 in two separate marijuana busts in less than 24 hours. The Guyana Police Force said at about 5PM Wednesday they acted on information and arrested a 21-year old unemployed woman of Parika, East Bank Essequibo after she was found in possession of 1.3 kilograms of cannabis in a taped parcel at the Bartica Stelling. 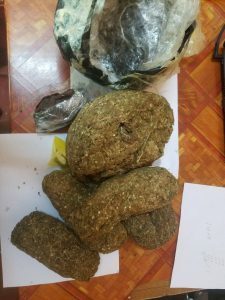 Meanwhile Thursday morning, a miner of Samaroo Dam, Pouderoyen, West Bank Demerara was arrested with several taped parcels of compressed cannabis, weighing in excess of 1.2 kilograms. The 35-year old man about 10:15hrs, minutes after he disembarked the Ferry at the Bartica Stelling. Both persons have been charged with Possession of Narcotics for the Purpose of Trafficking and will make their appearance at the Bartica Magistrate’s Court on Friday.